An APIARY FOREPERSON (NOC 8252) for immediate fulltime (40+ hrs/wk) year round employment ($19.00-$25/hr depending on experience. Bonuses possible). Applicant must have a minimum of 5 years (seasons) fulltime in a Canadian style commercial apiary environment with a minimum of 3 years (seasons) working as an Apiary Technician. •	Caring for honeybee colonies in the appropriate manner. •	Co-ordinating the production of replacement bees & equipment. •	Recognizing, reporting, monitoring and controlling hive health issues. •	Harvest & package honey, pollen & beeswax. •	Supervise & train workers. •	Drive (including std transmission & medium duty trucks) & daily maintain vehicles. •	Operate & maintain other apiary equipment (including forklifts, chainsaws & pumps). •	Conduct bee yard maintenance. •	Keep field and/or production records. •	Interact with external farm personnel. 5 APIARY TECHNICIANS (NOC 8431) for full time (40+ hrs/wk) employment ($17.00-$22/hr depending on experience. Bonuses possible) December 2018 thru October 2019. 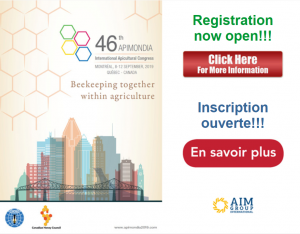 Must have a minimum of 2 years (seasons) working fulltime on a Canadian style commercial apiary in the min. capacity of Apiary Assistant or General Farm Worker. •	Recognizing, reporting, monitoring hive health issues and applying appropriate treatment/controls. •	Supervise small teams of workers. •	Keep some field and/or production records. 6 APIARY WORKERS (NOC 8431) for full time (40+ hrs/wk) employment ($15.00-$19.00/hr. depending on experience. Bonuses Possible) January thru October 2019. Applicants must be able to work in the presence of honey bees. •	Assisting Technicians with bees & equipment. •	Assisting with harvesting honey, pollen & beeswax. •	Assisting with the bee yard and equipment maintenance. All positions may require some evening, night & weekend work. All applicants must be in good physical condition and able to work in a team environment. A motor vehicle Operator’s license with no serious infractions, recognized by the Province of Alberta & major insurance companies, is required for the Foreperson position and preference will be given to those Technician & Worker applicants holding one.